As far as Superhero’s go, there are few as well known or as well liked as Batman. This legend created by DC Comics has had TV shows, movies, video games and more recently slots dedicated to his crime fighting escapades. 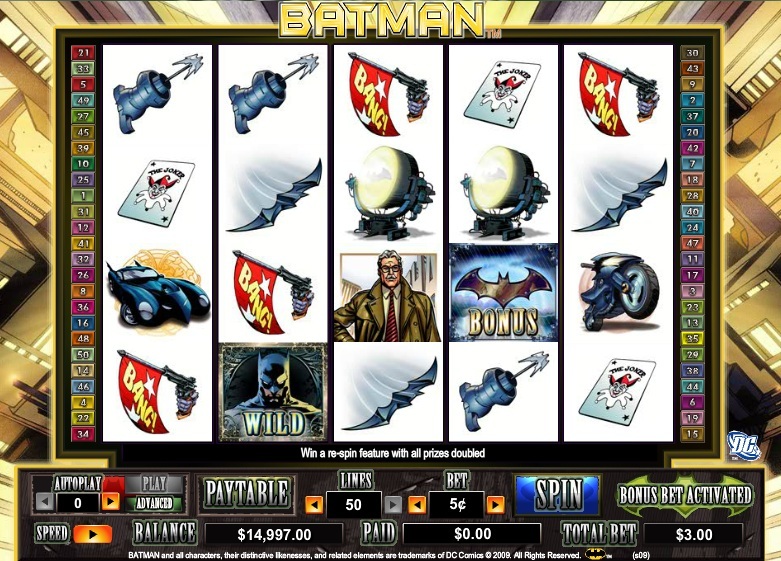 This particular Batman slot is from Amaya, the Canadian gaming company that swallowed up the original developer of the game - Cryptologic. This video slot has 5 reels and is based more on the TV show than the film in my opinion. There is no Robin, but Commissioner Gordon and The Joker do appear. Just like the Green Lantern slot, Batman has the Bonus Bet option which increases your bet by an extra 10 coins, but without adding any extra lines. The pay off is that you get an extra bonus, but I think it is a pretty annoying of the developer to do this. Feels like a ransom to get at the bonus features, which I don't like. 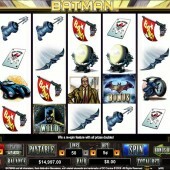 There are two notable bonus rounds in the Batman slot; Batman Re-Spins feature and Descent Into Madness feature. The re-spins feature occurs when Commissioner Gordon appear on reel 1 and the Batsignal on Reel 5, or the opposite way round. One of more of Reels 2, 3 and 4 will be held wild and you will get three re-spins with all wins doubled. The Descent Into Madness feature is activated by 3 or more scattered logos from left to right. You will then slip into Batman’s shoes and throw the baterang at inmates to win intstant cash rewards. Once the inmates clear off you then try and trap The Joker by short-circuiting the mains. Succeed, and you could be in for a win of 100x or more. Fail and you get another attempt, but it is likely your best chance has gone. Batman is actually one of better video slots in Amaya's range of DC Comics-inspired slots, but it still looks out of date in comparison to some of the more popular slot games available today. What it does have is some big wins up for grabs in the bonus, which can pay really well if you are playing the bonus bet.